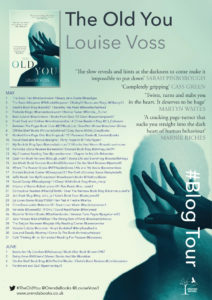 I’m delighted to be reviewing The Old You by Louise Voss today. Some years ago I read a lovely book by this author called Are You My Mother. I don’t remember a great deal about it but I do know it was a wonderful book and I still remember it very fondly. Since then, Louise Voss has changed direction and now writes crime fiction and psychological thrillers, and it’s one of the latter that I’m reviewing today. I’d like to thank Orenda Books for the review copy and Anne Cater from Random Things Tours for the place on the blog tour. 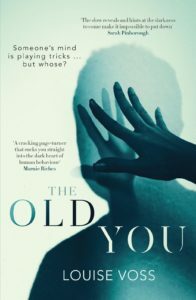 The Old You is absolutely compulsive reading. From start to finish it’s full of jaw-dropping twists and turns and I never knew who to believe, what to think. It’s quite the mindbender of a book! Lynn Naismith is happily married to Ed. Things are good, they love each other, they live in a nice house and Lynn has just got a new job. But then Ed is diagnosed with dementia and everything changes. More than anything, it’s his manner that changes, he becomes aggressive and unpleasant. And erm…this is really hard to review without giving anything away! What I can say is that this is one great read. It’s claustrophobic, intense and electrifying. I didn’t find any of the characters likeable but I sympathised with each one until, that is, the story turned on its head and sent me in a different direction which happened quite a lot. Lynn went on a similar journey throughout the story, one of discovery. Lots of secrets are revealed and each time I just gaped at the book and tried to digest it. The real skill behind the writing here is that I didn’t know who to trust and doubt was constantly in my mind. It’s described as Hitchcockian and yes, I think that’s accurate. It’s cleverly plotted and to be honest, I’m not sure how the author managed to come up with such a dark and unusual plot and keep it so realistic but she definitely did manage it. It’s a tale of manipulation, deception, secrets and lies and it’s a total triumph. Louise Voss has been writing for the past eighteen years, with many twists and turns in her career. She started her publishing life with four novels for Transworld/Black Swan, the first of which, To Be Someone, was published in 2001 with its own CD soundtrack. This was followed by three more contemporary women’s fiction novels, Are You My Mother? Lifesaver, and Games People Play, until she switched to publishing thrillers with Mark Edwards. 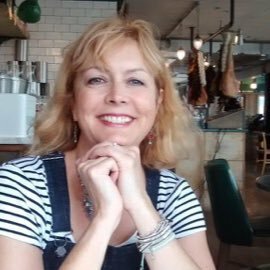 Louise lives in southwest London and can be reached on Twitter or on Facebook. I totally agree, this one is hell to review! I loved it, though, it felt like a special psychological thriller!